Excellent breakfast buffet. Parents weirdly let us eat cake and hot chocolate but still made us eat fruit. Saw a statue of a dog and a religious guy who was kind to animals. Walked up a big hill. Easy. Found a place where people feed stray cats. Fed cats. Played with cats. Fed cats. Played with cats. Had to go when parents got bored. Crossed a rocky troll bridge. No troll. Didn’t waste time crossing though. Found a cool cliff with cactuses. Tested prickles for prickliness. Surprisingly prickly. Saw waves crashing onto rocks in a way that would definitely smash a nuclear submarine to pieces and cause an explosion that would wipe Italy off the face of the earth and probably Europe as well and probably set off a third World War and cause a nuclear winter and an ice age. Which would be good for polar bears and also mammoths but not humans or cats. Saw a village and walked down to it. Rained. Had to go in a café and have a second hot chocolate until the rain stopped. Big toilet queue so did a wee into a train tunnel in plenty of time before the train came [parent had weirdly tight grip on back of tee-shirt the whole time]. Found a rock cave leading to a beach. Walked up a much bigger hill. Easy. Saw some huge hills that look like giant mammoth heads going down to the sea but are probably volcanoes which could erupt at any time and spew molten lava so high that it actually leaves Earth’s atmosphere and goes into space where it could be visible to passing aliens who might think we are attacking them and decide to fire back with their gamma ray missiles which would definitely blow up the world or at least the moon. Made it to the village without being killed by aliens. Found a cupcake tree with a gnome. Decided to walk to the last two villages. Parents looked happy so we asked if we could have a second gelato. Dad said this could actually be our first ever “three gelato day” ever in our lives ever. Decided to go really fast. Saw a plant which had froth on it which is probably lethal poison and has been used since Roman times to murder your enemies and probably if you got caught growing it you would be thrown into the Colosseum and fed to the lions and also have to fight a gladiator to the death with only a sack for a weapon and maybe a spoon which you could use to scoop out the gladiator’s eye and then when he’s trying to put his eyeball back in you could put the sack over his head and then feed him to the lion and then everyone in the crowd would cheer and the Emperor would let you live and you could become his Chief Poisoner. Didn’t see anything else interesting as going too fast. Beat Mum and Small to next village by 45 minutes. Dad took a while to find us but we weren’t kidnapped or anything but practiced karate moves so if someone did try to kidnap us we would definitely scare them away. Pitstop number three. First gelato, then the water. Really hot, really steep, really hard, really tired, really not that interested in the Cinque Terre, definitely dying of exhaustion. Large got mad and went back down to find a train. Made it to the top in half an hour. Easy. Half an hour later, ran down into the village square. Found a bar with a good view of the railway station. Parents kept looking at the other side which was nothing but cliffs and sea and they missed seeing most of the trains. Had a lemonade and watched trains. Spotted Large at the station. 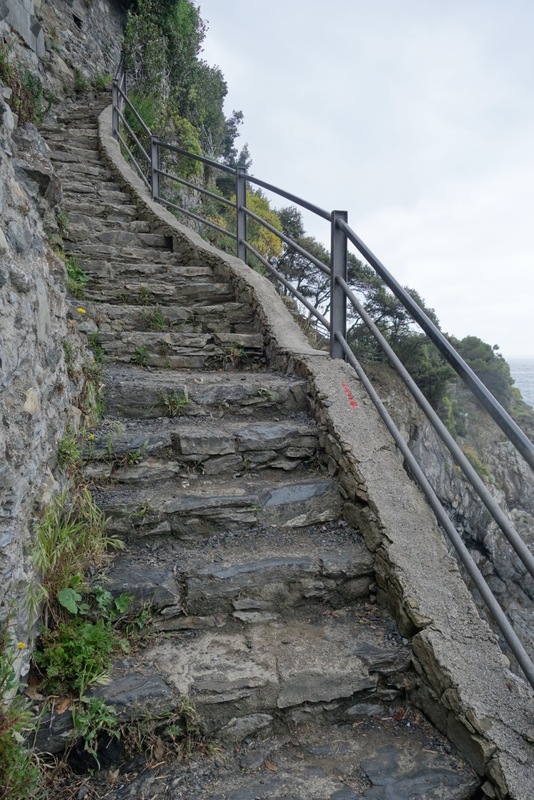 He had actually caught the lift to the station from the street which means that technically he did not complete the Cinque Terre. He disagreed. We disagreed. He disagreed. Parents got involved. Ruled that the whole family had completed the Cinque Terre. Even people who caught a lift down two storeys from the road instead of walking all the way. Caught a train back. Only took 20 minutes. Weird that it takes five and a half hours to walk but you can go on the train in 20 minutes. No pizza at the restaurant. Had to eat fish. Only Small had room in his stomach for gelato. 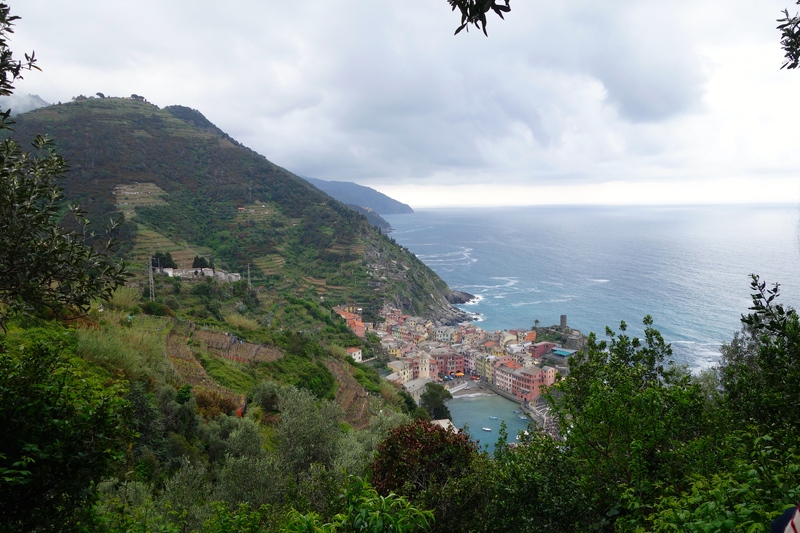 Note: End of April is a great time to do the Cinque Terre. Crowds are smaller than usual and if you are blessed with a bit of rain, as we were, most of the tourists stick to the shops and restaurants. Add to that the fact that a couple of the most popular “low” tracks were closed due to rockfalls and we had those high tracks largely to ourselves. All that is required is a reasonable standard of walking fitness and it’s quite possible to do it in a day with plenty of time for stops – especially knowing that you can catch a train back to base. Adults might like to take longer to really explore the villages, which are gorgeous, but our boys have little interest in that. 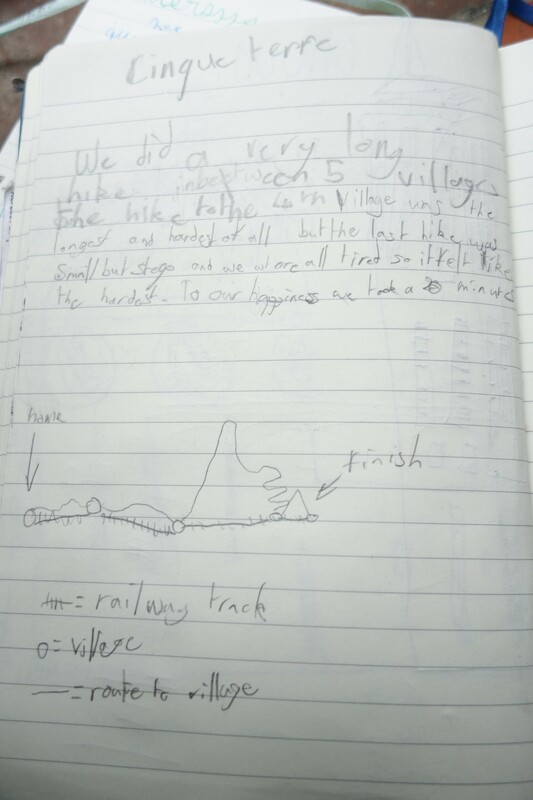 It was far better to do it as a challenge in a day so that we could sleep in on in our final day and have a day pottering around without a schedule. Ha thanks Barbara. We loved it – just so beautiful. 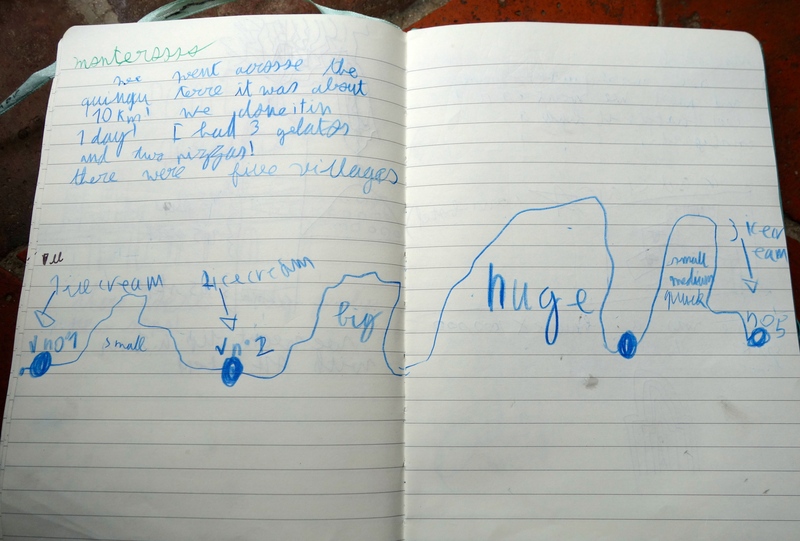 Now we know that we can take the kids on some great hikes when we are back in nz ! What a memorable day. I can see you gathering data to embarrass at 18th/21st birthdays in the future! Such a beautiful place to experience together as a family. Keep on enjoying and keep safe! Hi Theo here. Your tale has convinced me we need to do the Cinque Terre one day . (only because of the GeLato! ) cool photos. Hey Theo!! You would love it:) gelato is seriously good. A great read Karen and beautiful photos. Looks very picturesque.